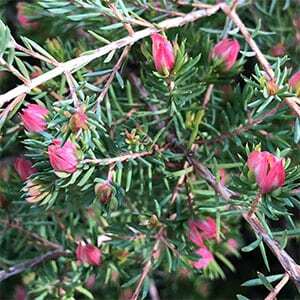 A wonderful low growing plant that will flower in light shade, Darwinia taxifolia subsp. macrolaena has small red flowers that appear in small clusters. Flowering in mid spring the flowers are bright when fully open and contrast well against the green foliage. It is low growing and will cope with poor soils beneath trees and still flower well. It makes a good ground cover plant and can also be grown in containers for a courtyard display. This is a great plant for a rock garden and can also be grown in containers. A well drained soil is essential and some mulch around the plant will help maintain a cool root run. As it will grow in shade, it is a grate little ground cover for planting beneath trees. A little specialist native plant fertiliser in spring is all that is need if you mulch well. Regular light pruning after flowering will help keep the plant as more compact form. Position – Full sun to semi shade. Soil – Humus rich, well drained. Height – To around .5m to 1 metre. Flowering Time – Mid Spring.